This spring, JBL will launch the L100 Classic, a modern version of the company's best-selling L100 bookshelf speaker, first released in 1970. The speaker is a three-way design that uses JBL's newly developed JT025Ti1 one-inch Titanium dome tweeter mated to a waveguide with an acoustic lens--along with the JM125PC five-inch cast-frame, pure-pulp cone midrange driver and the 1200FE 12-inch cast-frame, white pure-pulp cone woofer in its own bass-reflex enclosure. 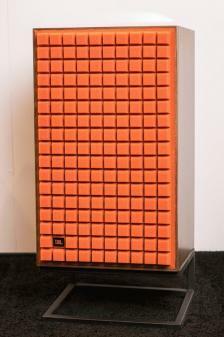 The L100 Classic has a 1970s-style retro design, with JBL's iconic Quadrex foam grille in black, orange, or blue. The speaker will carry an MSRP of $4,000/pair. HARMAN International is introducing the JBL L100 Classic, a modern take on the all-time best-selling JBL L100 loudspeaker. As with the legendary L100 three-way bookshelf loudspeaker released in 1970, itself a consumer version of the popular JBL 4310 Pro Studio Monitor, the new L100 Classic follows on the heels of the successful 4312SE 70th Anniversary Studio Monitor model launched in 2016. The new L100 Classic loudspeaker system features an attractive, 1970s-style retro design, with vintage JBL styling including an iconic Quadrex foam grille in a choice of three colors--black, orange, or blue--all with a black and bronze JBL logo. The enclosures are finished in a genuine, satin walnut wood veneer with black front and rear panels. The original L100 production run included the L100, along with the subsequent L100A and L100 Century evolutions that quickly followed and ran through the end of production in 1978. That fundamental compact 12-inch three-way design is maintained in the L100 Classic, with improvements made to the transducers, enclosure tuning, and crossover network design. Designed by Chris Hagen, the same acoustic system engineer that created the L100T3 in 1988, the L100 Classic benefits from decades of JBL engineering prowess along with the world's most advanced acoustic engineering resources available in HARMAN's Northridge, California, design center. The L100 Classic uses the newly developed JT025Ti1 one-inch (25mm) Titanium dome tweeter mated to a waveguide with an acoustic lens for optimal integration to the JM125PC five-inch (125mm) cast-frame, pure-pulp cone midrange driver located directly below. The vertical HF and MF transducer arrangement is slightly offset to the right of the woofer below, with HF and MF attenuators located on the upper left of the front baffle. Low frequencies are delivered by the 1200FE 12-inch (300mm) cast-frame, white pure-pulp cone woofer operating in a bass-reflex enclosure system that is tuned via a single, front-firing port tube with flared exit. Connections are made via a pair of gold-plated binding post terminals located on the rear panel. This passive, three-way bookshelf loudspeaker measures approximately 25.5″ H x 15.5″ W x 13.75″ D and can be oriented either vertically or horizontally. Optional black metal floor stands are available with included adjustable carpet spikes. The walnut wood frame grille is available with the iconic Quadrex foam insert in a choice of black, orange, or blue. • Visit the JBL website for more product information. • JBL Synthesis Announces SCL-2 In-wall Speaker at HomeTheaterReview.com.